If you go into your local scrapbooking store or browse through magazines you’ll see cute scalloped edges on papers, chipboard embellishments, punches and so much more. They provide a simple but elegant accent on your page, and can work well for any theme depending on the color, style or pattern of paper used. They are especially sweet on wedding and baby pages when done in pastel tones, and wonderful for celebratory pages when used in brighter, fresher colors. You can also enhance or change the scallops in a number of ways for a unique twist. As beautiful as these scallop edged papers are and as much as I love using them, sometimes I don’t have them on hand when I need them or I can’t find them in the color I want. And, they are usually much more expensive than regular papers, which offends my frugal sensibilities as I prefer to pay .25 per paper, not $1.50 or more! So, here are five on-the-cheap techniques how to make your own scallop edged papers and ten ideas for using them in your projects. I bought a set of two doubled-edged template rulers with decorative edges at my local dollar store priced at 2 for $1.00, so this is a very easy and inexpensive technique. Line up the scalloped edge of the ruler with the edge of your paper. Holding the ruler firmly so it doesn’t slide around, trace lightly around the edges of the scallops on the back side of your paper. I like to use a mechanical pencil to get a fine, sharp line. 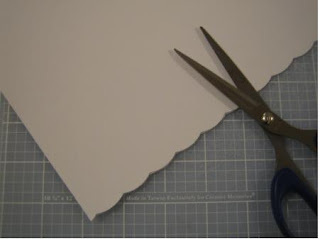 Cut away the excess paper carefully using sharp, pointed scissors. It may take you a bit longer to cut this scalloped edge out by hand, but the savings are worth it. Turn the paper over to hide the pencil lines. Decorative scissors are an old standby – in fact you probably have some in your creative tool box that you haven’t used for a long time! If you do, get them out and rediscover what they can do. If not, pick up a pair at a craft, discount or dollar store – mine are by Provo-Craft and I bought them at Michaels for $1.79. A bonus is that you’ll find many sizes of scallops to suit any project. 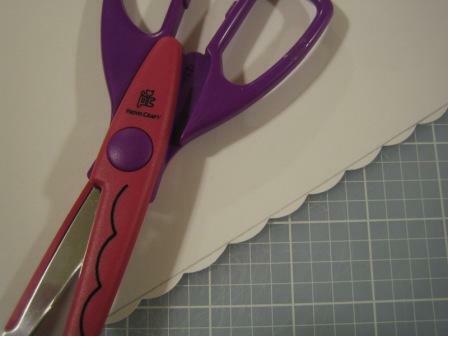 It can be frustrating to get a straight edge using decorative scissors, so here are a few tips. Make a pencil guideline…this will keep you from veering off course and having a slanted edge. Take your time in cutting, lining up the points of the scallops along the pencil line as you go. Turn the paper over to hide any pencil lines. 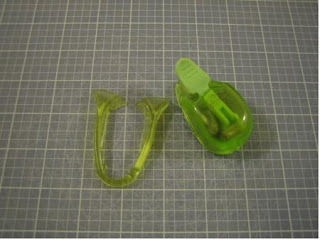 Not all corner rounders will work for this technique – you will need to use one that has a removable guard on it. 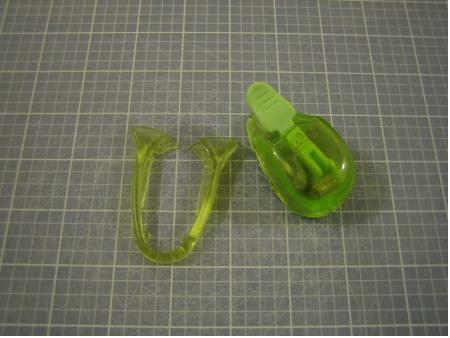 I used an EK Success corner rounder that I picked up at Wal-Mart for $5.49. This technique is easy and fast. Remove the guard. This will allow you to cut along the flat side of the paper, not just on the corners. Line up the edge of the corner rounder with the edge of your paper. Punch. 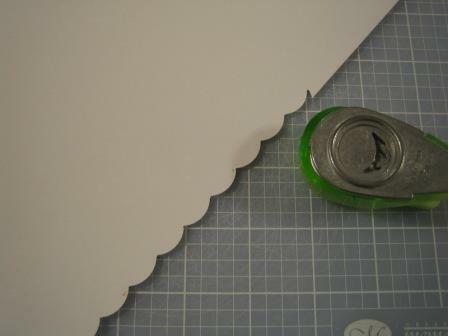 Move the corner rounder along the paper to now line up with the tip of the first scallop. Punch. Continue punching all the way around, carefully lining up the edge of the rounder with the tip of the previous cut. You’ve probably seen cute scalloped shapes (like circles and ovals) used on everything from scrapbook pages and cards to crafty home décor items. 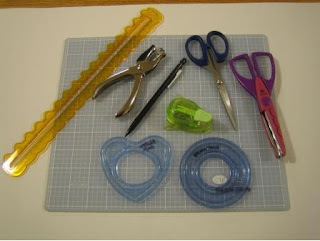 You can purchase punches at craft stores to cut out these shapes, but usually they range in price from $10 to $20 each depending on the make and size. Why not try making your own scalloped shapes to use for photo mattes, journal or title boxes or embellishments using a cutting system you may already have? First trace out the shape you want – a rectangle, circle, oval, square or even a heart. Following the instructions in Technique #2, use your decorative scissors to carefully cut using a smooth motion around curved edges and always lining up the points of the scallops with the pencil guideline. Turn shape over to hide any pencil lines. 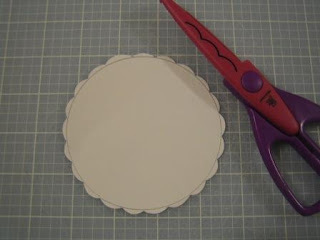 Your scalloped edges will be lovely as they are, but this next technique adds a little bit interest and variety. Draw a pencil guideline down the row across the centre of the scallops. 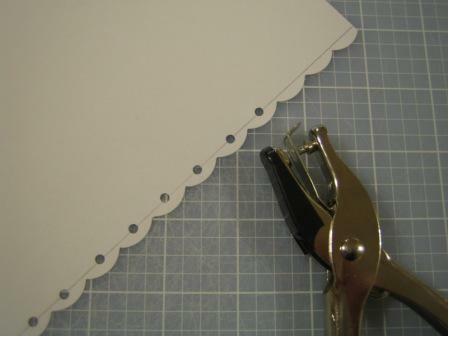 Using a very small hole punch, punch a hole in the centre of each scallop. This will also allow the color of paper used underneath to really show through as an additional accent. Turn paper over to hide pencil lines. Now that you have made your scalloped edged papers and shapes, here are 10 great ideas on how to use them on your scrapbook pages and in other paper crafting projects. Scallop all four edges of an entire 12 x 12 paper (or whatever size page you are using) and place it over a contrasting color paper for a gorgeous background. Cut strip(s) with one straight edge and one scalloped edge to use as a page border for one or both sides of a layout. Cut and place the strip(s) across your page horizontally to divide your page or border the tops and bottoms of photos. Use your scalloped shapes as mattes for photos or journal boxes. 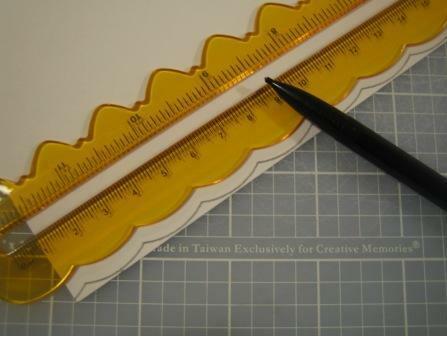 Create your own 3-D embellishment by adding a second plain shape on top of a scalloped shape using a pop-up glue dot. Finish it off by adding a sticker or stamp to the shape on top. Weave a ribbon or string through holes punched in the scalloped edge. Scallop one or both edges of a folded card. Scallop the edge of a specialty paper such as vellum, metallic paper, mulberry paper or handmade paper for a different look and feel. Gently ink, chalk or paint the scalloped edge using a Q-tip to get in between each scallop. This looks especially good on shabby chic and heritage type pages. Try any or all of these techniques and tips the next time you are looking for something different for your pages, but you don’t want to spend a fortune. 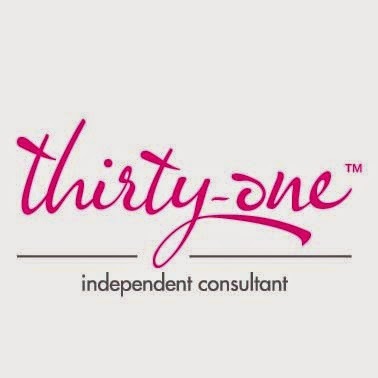 Your pages and your wallet will thank you!